Show #41 Special Guest, Lisa Jo Rudy with Her Book "Get Out, Explore, and Have Fun"
Lisa Jo Rudy is the mother of Tommy, age 14, diagnosed with PDD-NOS -- an autism spectrum disorder. She is also a professional writer, researcher and consultant. Lisa and her videographer/photographer husband, Peter, live in Massachusetts. Their son, Tom, is homeschooled and their daughter, Sara, attends public school. 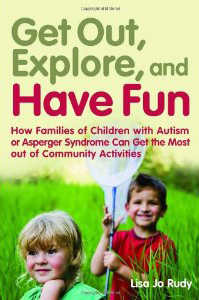 Lisa is the author of the book "Get Out, Explore and Have Fun:How Families of Children With Autism or Asperger Syndrome Can Get the Most Out of Community Activities," published in May, 2010 from Jessica Kingsley Press. She is available as a speaker for conferences and events, and may be contacted at lisa@lisarudy.com for specific details. Lisa is an active autism advocate, writing for and speaking at various autism-related events and programs. She is also a leader in program development for children on the autism spectrum, having spearheaded the creation of a summer camp program for children on the spectrum in collaboration with the Philadelphia-area YMCA. In 2004, Lisa led a panel presentation on "Welcoming Children Who Learn Differently" at the annual Association of Science Technology Centers conference, and authored a paper on the same topic for a publication of the American Association of Museums. Since 1992, Lisa has developed hands-on, interactive educational materials for clients including The National Science Foundation, The National Geographic Society, Space Telescope/NASA, and the Smithsonian Institution. She also writes for major publishers including CNN.com, Time, and Scholastic. Lisa holds a Bachelor of Arts in the Humanities from Wesleyan University and a Master's Degree in Divinity from Harvard University. She also holds certificates from The Interdisciplinary Council on Developmental and Learning Disorders (ICDL). What made Einstein, Mozart and Turing great? Could it have been their autism spectrum disorders? At About.com, we have the ability to pool our knowledge to help every individual on the autism spectrum achieve their own greatness. Visit my site, and join the Autism at About.com community on Facebook! Newer PostDr. James Neubrander - Special guest on upcoming "Hope Saves the Day"
Older PostShow #40 Elaine Hall - Special guest on "Hope Saves the Day"